Many, many photos of the reflection of Mt. 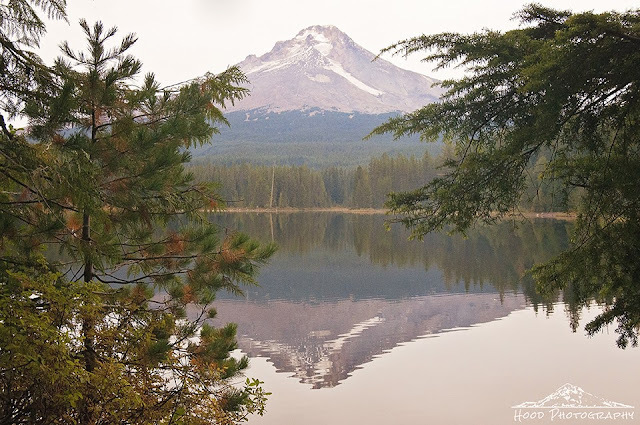 Hood on the mirror-like waters of Trillium Lake have been taken. It is hard to get a unique perspective. I used the framing of nearby evergreen trees to bring a little something different to the otherwise rather drab, white-skied day that we woke up to on Thursday morning after a few days of camping. Incredible shot. I like the framing very much. Really nice framing and reflection. Very pretty. I can feel the quite. The pine trees made a perfect pizzzazz frame for your beautiful photo. Every one of the photos is unique, just like a sunset shot. Each one is beautiful in a different kind of way. LOVELY shot of the LAKE, I LOVE the framing of the trees. Just wander there..... sit down ....and enjoy the surroundings and peace and quiet... wow! I absolutely love the framing, it is a terrific perspective. Well done.